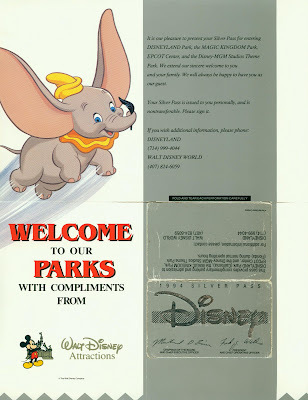 Today’s themed ticket post was an idea sparked by a great scan sent to me by Major over at Gorilla’s Don’t Blog (link). 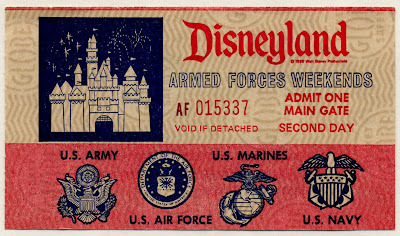 Disneyland had several special ticket plans for members of the armed services; let’s take a look at a few of them today. 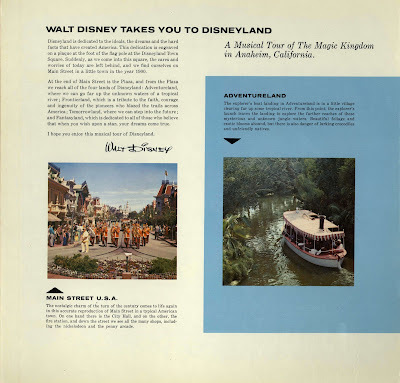 Inside the May 1970 book are 10 special tickets, very similar to “magic key” tickets of the time, with the exception of these getting that special cyan print color on the key and “Admit One”. Also, Major reports the actual tickets in his book are 10¢ thru 85¢, so my “loose” ticket example below must be slightly older than 1970. Next up, “Armed Forces Weekends” these examples are from the “ticket binder” scan collection. I think it says "1968". Nice touch with the each branch of the service getting there own logo/shield. Serial number begins with “AF”. Two admissions and 12 tickets, still a great deal at $5.25. From my collection, dated September 1977, it’s “Military Weekends”. This book has never been used. It has a “Second Day” ticket under the “First Day” ticket, then 12 green "good on any attraction" key tickets, with standard red print. Serial number begins with “MW”. You may have noticed that neither Major or myself have folded back these mint tickets, we are dedicated fans, but not that dedicated! Still a great value at $6.50. *** Update*** Hey if you like this mint ticket book, there is one for sale on eBay right now (link), no I'm not the seller, I'm the guy who buys tickets on eBay! Last up it’s “Military Night at Disneyland” Friday, April 8, 1988. Star Tours was only a year old so it’s still getting plenty of promotion, can’t you just hear R2D2’s cute little sound in your head? On a personal note; Whenever I see a member of the armed services, I make it a point to shake their hand and thank them for their service; we all owe our freedoms to them. It’s Audio Visual souvenir day and today we have an oldie but a goodie. 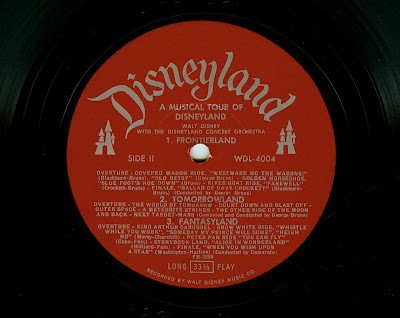 “Walt Disney Takes You to Disneyland” a “Disneyland Record” recorded by “Walt Disney Music Co.” with the “Disneyland Concert Orchestra”. That’s a lot of “Disney’s”! 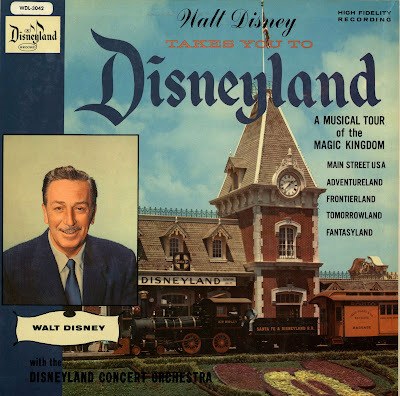 See this and other Disneyland Record covers over at “A Sampler of Things” (link). These were originally from 1956. This one is old, not sure it it’s from 1956, but it’s a “High Fidelity Recording” and the record itself is as thick as a plate! 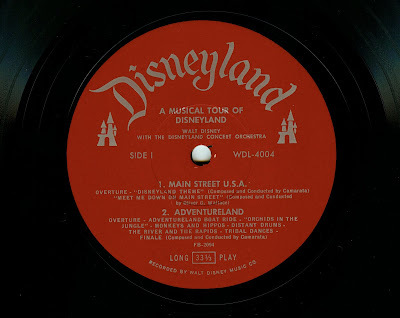 You can actually buy the CD from Disney (link) they place this LP as 1956. Great cover, glossy and still in great shape, Walt sure looks proud to be on the cover. Song information and a fun map on the back. 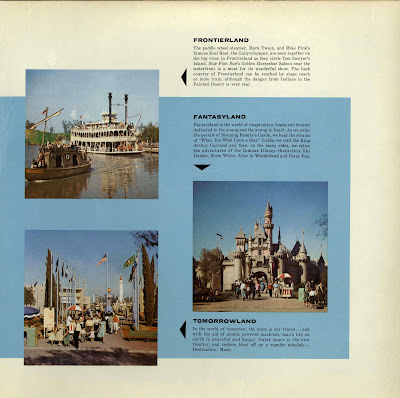 Check out the Tomorrowland lagoon, look at the little Air-Boat, is that the Phantom boat replacement that never made it? 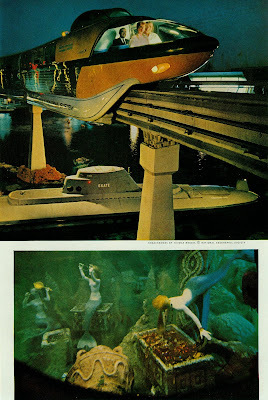 I’ve seen an attraction poster for those somewhere? Here are the Long Play 33 1/3 record labels. And now a few choice samples. Please keep in mind this record is old. I cleaned it as best as I could, but it still has some cracks and pops, however the music still comes thru nicely. I wonder if Walt recorded the vocals just for this record. You really don’t hear much (if any) of this great audio being reused or maybe I’ve just missed it. 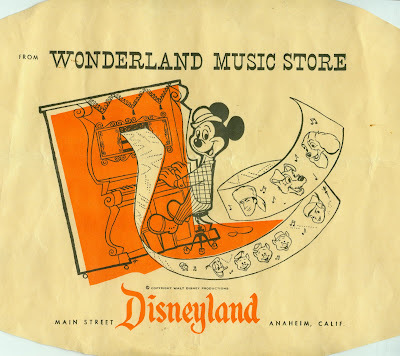 I hope you enjoyed today’s show and tell, if scratchy old records aren’t your thing, come back tomorrow for some Vintage Disneyland Tickets. The Knott’s Berry Farm “D” ticket had the shortest life span of all the lettered tickets and the fewest changes; therefore it’s going to fit in one big post. Before we continue, let me say it’s been such fun putting together this Knott’s "A Thru D" series, I’ve learn a lot and I hope you did to. You can see the entire Knott’s lettered ticket series here (Link). The very first “D” ticket, this Child's ticket is from May 1975. 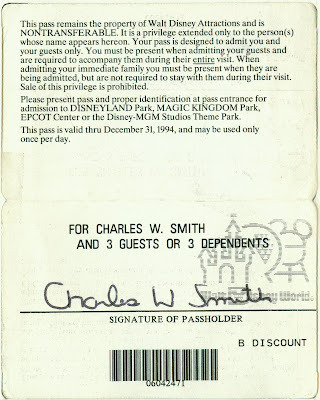 There are only four attractions for this “least valuable” of the lettered tickets. However, they’re pretty decent attractions. 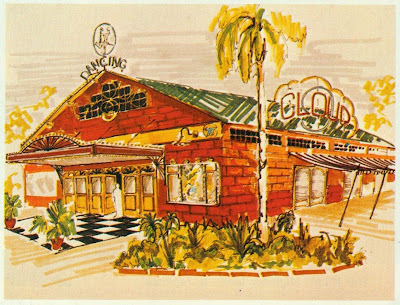 The Shootin' Galley and Archery Range were at Knott’s for a while, odd that I can’t find a photo of either one! 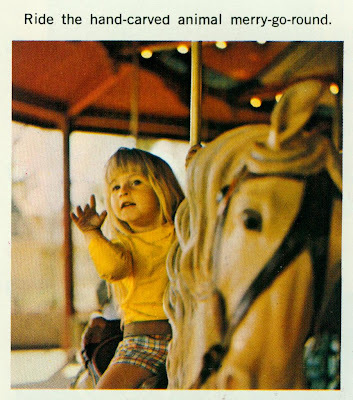 The Merry go round, in its old location. 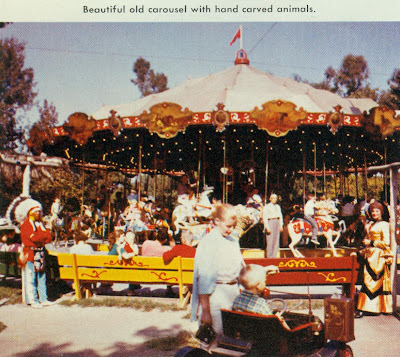 The Merry go round is now near what’s left of the lake. At least it’s there on the 2008 map, tomorrow, who knows! 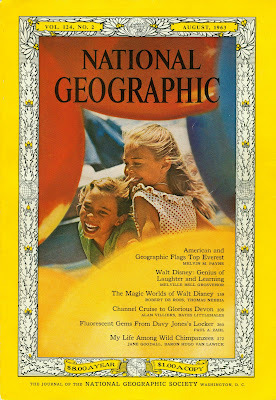 May 1976 has a new land added; the Roaring 20’s and the “25¢ Arcade Games” are on the “D” ticket. I remember the Arcade, but I don’t remember how you used these tickets for the games, did you exchange them for a token? I think the Arcade is still there. The last of artists Wendy Pelzer’s great concept art work. “Cloud 9” Did they build this? A nice “Grey Globe Paper” “D” ticket from April 1979. 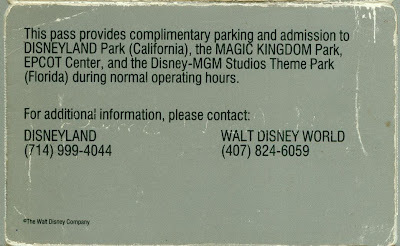 This is the same grey found on many Disneyland “C” tickets. 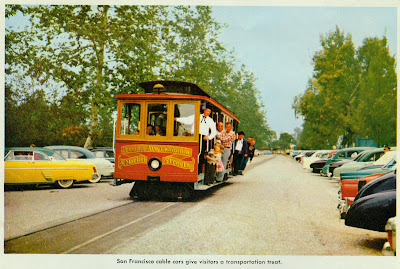 This is the last appearance of the Cable Cars. 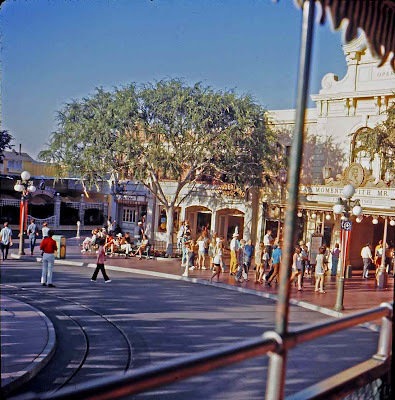 I believe the area for the Cable Cars was used to extend the park and the Camp Snoopy kid’s area. Where did the Cable Cars go? I hope not busted in half like the Cordelia K. Steamboat! 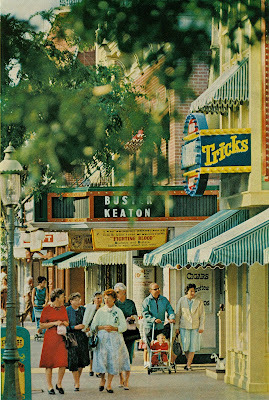 OK Knott’s experts, I need help on this March 1980 “D” ticket. I figured this post would hold no surprises; the “D” really didn’t change much. BUT, what the heck is “Black Bart’s Trail (Summer 1980)”? This will disappear off the next “D” in 6 months. What was it? I only find two hard references to “Black Bart’s Trail”. (1) Disneyland 57/58 had a character named “Black Bart” (See post on Gorilla’s Don’t Blog) but that makes no sense in this context and (2) There is a reference on Ultimatehaunt.com (link) that talks about a 1978 “Black Bart’s Trail of Terror” which is described as a “fun house” maze of mirrors and hallways near the graveyard in Ghost town “One of the first things you encountered in this "fun house" maze was an upright coffin, which featured an authentic dead body!” WOW, Knott’s went for some serious realism! But I don't think that is what this ticket is talking about, does anyone know? January 1981, last of the “D” tickets. 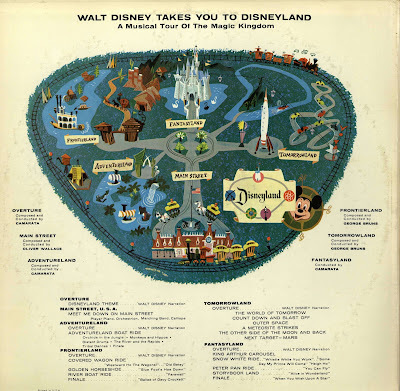 No changes except “Black Bart’s Trail” is gone. Here, take these and head to the Arcade, I hear there’s only a short line to play Asteroids! Well folks, it’s been a fun series. 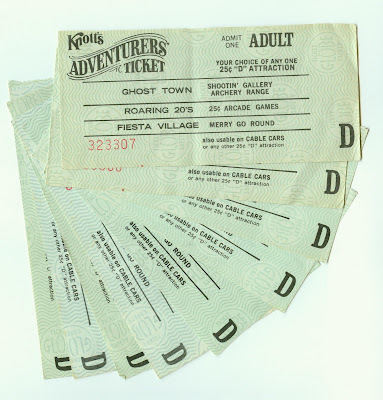 There’s still plenty of Knott’s tickets and stuff in the vault, so fear not Knott’s fans. Check back soon for more Knott's fun. Welcome to Bonus Sunday here at the blog. Today we have two extra nice items for your perusing pleasure. 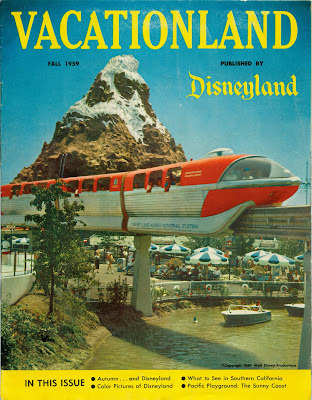 First, have you seen the new Monorail at Disneyland? I haven’t seen it in person yet, but check out this picture from “DarkBeer's Monday in the Park” article on Miceage (link). This is a BEAUTIFUL machine; I have read it's whisper quiet and looks stunning gliding around Tomorrowland. 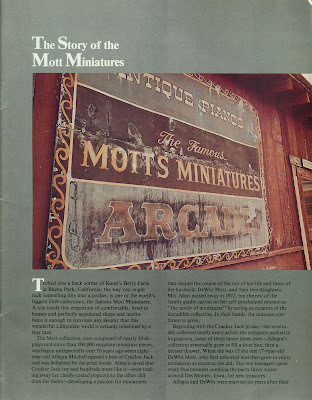 Up next, from Knott’s Berry Farm it’s the Mott Miniature Collection complete guide. This was the coolest display Knott’s every had. My first memories of Knott’s are these Miniature Displays. 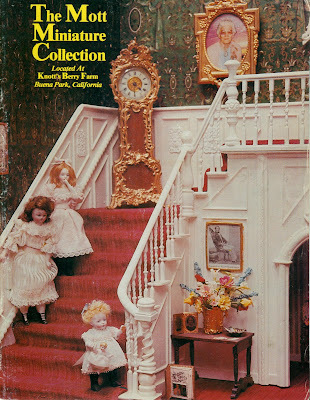 I was so enthralled with this collection when I was a kid, all I wanted to do at Knott’s was just see these displays! My dad would patiently stay with me for hours while I checked out each and every one. Most of the displays have funny names; “C.D. Boyd – Photographer”, “T.R. Ash – Second Hand Store”, “A. Bullina China Store” and many more. From what I have heard, the collection was broken up and auctioned off. I am not even sure if the building is still there, somehow I think it's gone too. 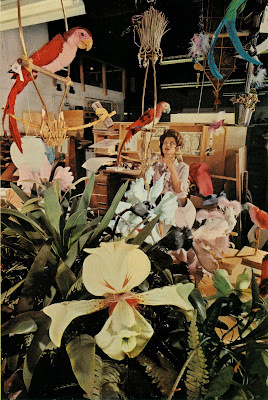 Interestingly, my strongest memory of the Mott’s display is not included in the 45 pages guide above, it’s the tiny TV! Just to show I’m not crazy, and Ken over at “Outside the Berm” knows I’m not crazy because HE HAS THE TV!!! Here is a neat old ticket for Mott’s showing the TV, not dated, mid 1960’s? 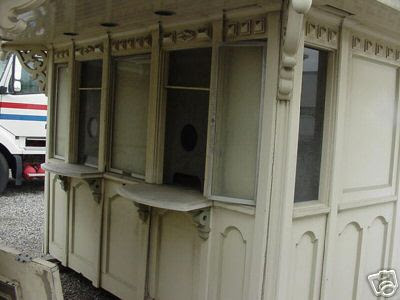 I search EBay all the time for “Vintage Disneyland Ticket” and I find all sorts of things with that search, but I have never found this, an actual Vintage Disneyland Ticket Booth????? (EBay Item number: 200218778523). This looks like the real deal to me. Ok, first I am sure this will be priced so far over my head I wont even see it, but if somehow I could buy it, where would I put it? Living room? Den? …. These are two pictures from the EBay auction. The auction states "one of six". 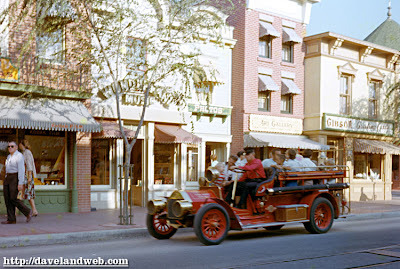 Tomorrow: Knott’s Berry Farm – The “D” Ticket - Part 1 of 1. 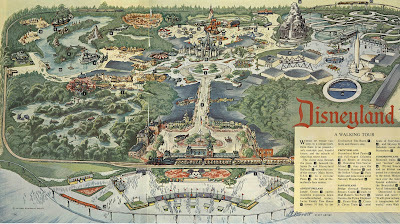 Here’s a lavishly well done article all about Walt Disney and Disneyland. This article is from the August 1963 Edition of National Geographic. There is a much smaller article from the October 1962 Edition, but it’s only two pages, I’ll post that another time. I sure like this cover; to me, it feels like “Camelot” at its peak, America’s innocence still not lost. This is really a fine and detailed article with great photo's and layout work. Please read this last page, some fascinating stuff here. 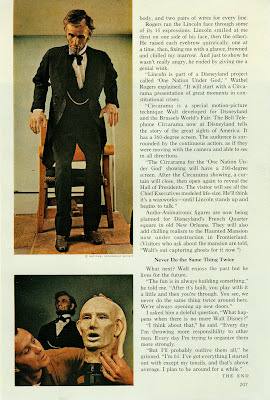 The “One Nation Under God” show with the “Hall of Presidents”, references to the French Quarter Square in old New Orleans, the Haunted Mansion under construction in Frontierland! Bonus Sunday: Mott's Miniature's full guide post, plus ? Quick post today, light on text. I'm late, I'm late, for a very important date. 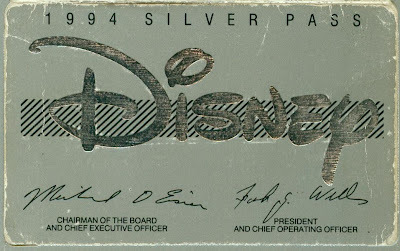 This "Silver Pass" from 1994 seems like GOLD to me! How in the world did you get one of these? I am guessing you couldn't even buy these, but then how did you get it? Better question, do they still have these? 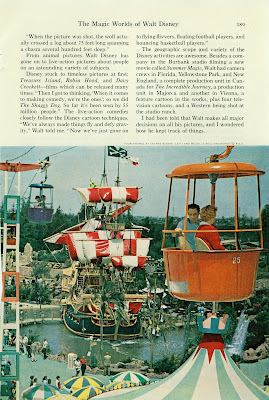 Tomorrow: Per a readers request, another Disneyland Magazine article. 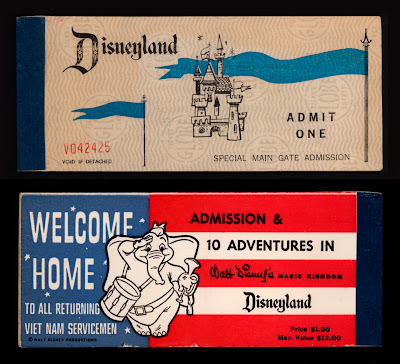 Going way back to June 1957, these "Special Guest Cards" were special indeed. Although not inexpensive, they must have been like gold. 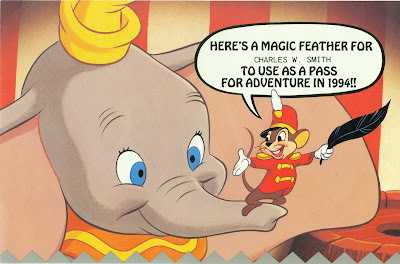 It's not clearly stated, but it appears you get into Disneyland and get unlimited use of the rides and attractions. No big deal in 2008, a huge deal in 1957! This poor adult ticket has a hole in it, did someone punch it thru for a button? This "sleeve" from the Wonderland Music Store came with these tickets when I got them, but I don't know if it's from the same year? It was open from 1955 to 1972. I think this sleeve is for sheet music, it's larger then the scan shows by a couple of inches. 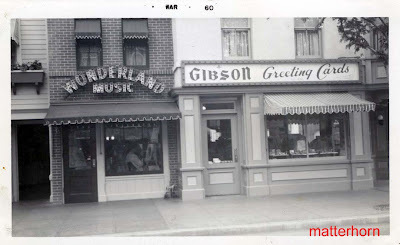 It appears that the Wonderland Music Store moved around a bit during its 17 year run. From Davelandblog, this is from 1957/58. 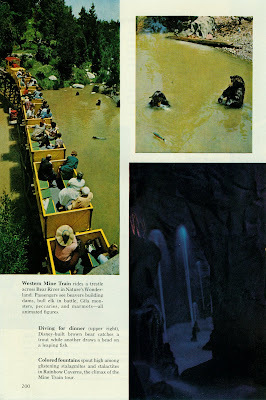 And from Gorilla's don't blog, 1970 finds Wonderland near Mr. Lincoln! I should know this, but what's there now? What's gotten into the Matterhorn at Disneyland?